This story has been updated Friday, October, 29. U.S. District Judge Leonie Brinkema has canceled a hearing to determine the fate of the contempt prosecution of Sami Al-Arian which was scheduled for this morning. In a one-page order, Brinkema said "that a hearing on these issues is not necessary. The parties have fully briefed their positions and the Court is working on an opinion which addresses all relevant issues." Prosecutors asked for the hearing in late August, and the hearing date has been set since Sept. 8, court records show. It is not known why Brinkema waited until the last minute to decide a hearing wasn't needed, or how long it take for her to produce a written order. As explained in the original story below, the issues pending before the court have been stagnant since April 2009. Prosecutors and attorneys for Palestinian Islamic Jihad (PIJ) operative Sami Al-Arian meet in an Alexandria, Va., courtroom Friday morning to learn the fate of a two-year-old contempt case. Defense attorneys want the criminal contempt case against the former University of South Florida professor dismissed. Prosecutors want U.S. District Judge Leonie Brinkema to reject that motion, set a trial date and preclude the defense from arguing he relied on the advice of counsel in refusing to testify before a federal grand jury investigating possible terror financing. Al-Arian was indicted in June 2008 for defying subpoenas to provide immunized testimony. He claims his plea agreement to a charge of conspiring to provide services to the PIJ in 2006 was supposed to rule out such testimony. 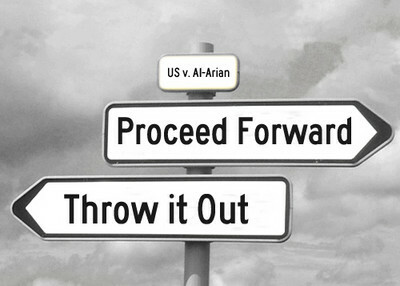 Al-Arian's lawyers argued in their motion to dismiss the contempt case that prosecutors reneged on a promise to that effect. They hang that claim on the absence of any clause in the plea agreement discussing possible cooperation. A grand jury subpoena, however, is compelled testimony, and appellate courts rejected that argument during litigation over an earlier, civil contempt citation against Al-Arian. The 11th Circuit Court of Appeals, which includes Al-Arian's former home state of Florida, said the lack of a standard cooperation clause "does not establish that the government immunized Al-Arian from future grand jury subpoenas. This contention is especially dubious where, as here, the plea agreement contains an integration clause stating that there are no other promises, agreements, or representations except those set forth in the agreement, and Al-Arian denied at his plea hearing that he pled guilty in reliance on any promises or inducements except for those found in the agreement." Despite this earlier appellate ruling, Brinkema was openly skeptical of the government's position, asking in hearings whether "winks and nods" were given to induce Al-Arian's guilty plea to the conspiracy count. In response, prosecutors emphasized the lack of any documents to substantiate the defense claim and Al-Arian's own statements when he entered his guilty plea. A U.S. Magistrate in Tampa asked whether anyone had promised him anything else as an inducement for his guilty plea. Defense attorney Linda Moreno mentioned a government pledge to expedite Al-Arian's agreed upon deportation once his sentence was up. The magistrate then asked Al-Arian directly whether there were any other government promises. The motions currently at issue were filed more than 18 months ago. Brinkema canceled a hearing to discuss them but then never issued any rulings. The case essentially has been frozen since April 2009, with Al-Arian living with one of his children on house arrest. The government appears to have broken the logjam by requesting the latest hearing, telling the court "The United States Department of Justice and the United States Attorney have reviewed the status of this prosecution, and urge the Court to rule on the outstanding motions so that the prosecution can proceed." If the case does proceed, prosecutors want Brinkema to bar defense attorneys from arguing to a jury that Al-Arian merely followed the advice of his lawyers in defying the subpoenas. Brinkema rejected that request earlier in the case. But a subsequent appellate ruling in the Fourth Circuit, however, found that a defendant's "reliance on counsel's advice to fail to appear as ordered, does not negate the willfulness element of the contempt offense." Public explanations for his refusal to testify have changed over time. An attorney initially claimed the testimony might endanger his life. His wife later said he "he will never turn into an informant." Now, the emphasis is on the claim that he wouldn't have pleaded guilty without a promise that this wouldn't happen. For previous coverage of the contempt case, see here, here and here.